Glory is God expressed, God shining out. New Jerusalem is a city but Revelation is a book of signs. As a sign, the city represents the ultimate stage of the kingdom of God. The kingdom exists today as a hidden, spiritual reality which will be manifested in the kingdom age and in eternity. Matthew 5:35 says “Jerusalem…is the city of the great King.” This is a quote from Psalm 48:2, ” Beautiful in elevation, the joy of the whole earth, Is Mount Zion, the sides of the north, the city of the great King.” Surely New Jerusalem will be the most beautiful city and it will be the joy of the whole new earth. 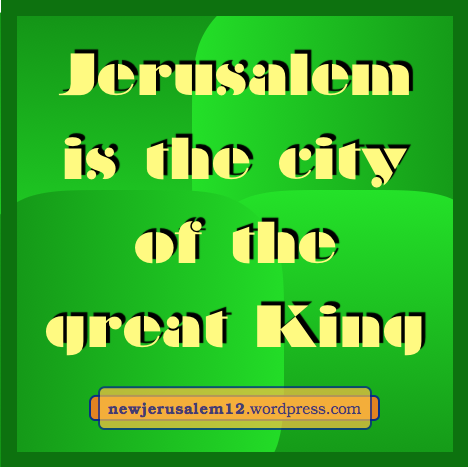 New Jerusalem is composed of the great King and all His people. A view of the city concerning its people is in Matthew 5:14, “You are the light of the world. It is impossible for a city situated upon a mountain to be hidden.” New Jerusalem is full of divine light; “the city has no need of the sun or of the moon that they should shine in it, for the glory of God illumined it, and its lamp is the Lamb” (Rev. 21:23). As a city, New Jerusalem portrays the kingdom of God brightly shining with the glory of God to illuminate the whole earth. Three verses in the New Testament speak of the Spirit as a pledge/deposit/guarantee/ down payment*. A fuller meaning is that which is assured by God to believers…the Divine pledge of all future blessings**. These future blessings include New Jerusalem. 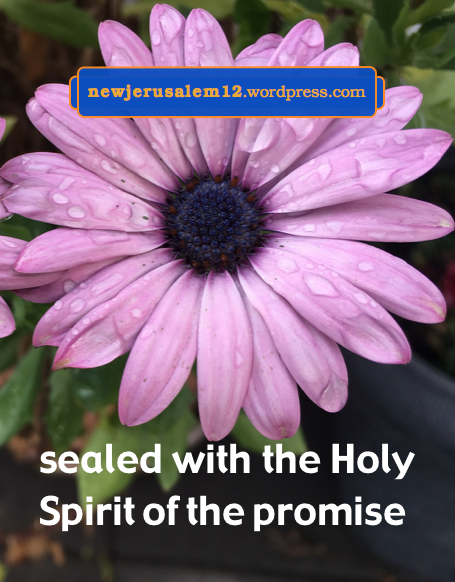 Second Corinthians 1:22 tells us that God has “sealed us and given the Spirit in our hearts as a pledge.” The Spirit as a pledge, a down payment, means that we will receive more of the Spirit in the future. Eternally, the Spirit is portrayed by the river of water of life in New Jerusalem. Second Corinthians 5:5 also speaks of the Spirit as a pledge. Our guarantee is not a thing or a legal document; rather it is the Spirit Himself, the Spirit who is the reality and who guides us into all the reality (John 16:13). God put His Spirit within us and also sealed us with this Spirit. 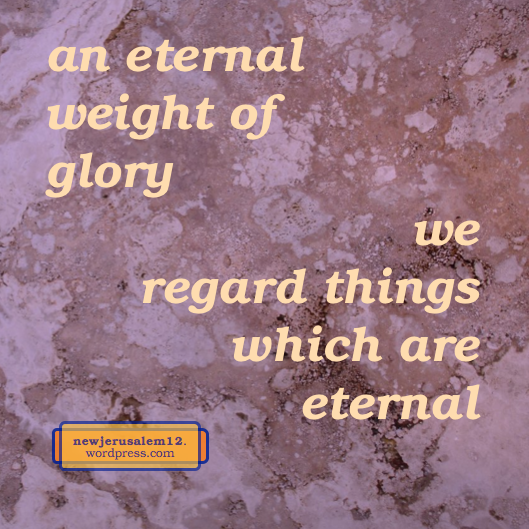 This sealing keeps us for our divine inheritance, which is much more of the Triune God in the next age and the fullest portion in New Jerusalem for eternity. In Ephesians 1 the Spirit as a pledge guarantees the redemption of our mortal body “to the praise of His glory.” God’s glory will fully shine forth from New Jerusalem and the entire universe will praise Him. * Various translations in these verses, thanks to Bible Hub. ** Vine’s Expository Dictionary of New Testament Words. God has chosen and predestinated us unto sonship “to the praise of the glory of His grace” (Eph. 1:4-6). This praise culminates with the glory of New Jerusalem. We have the sonship, yet Romans 8:23 says, “we ourselves also, who have the firstfruits of the Spirit, even we ourselves groan in ourselves, eagerly awaiting sonship, the redemption of our body.” We have the sonship but we are awaiting the fulness of this sonship. The fulness will occur at the redemption of our mortal body. The mortality of our body, with its weaknesses, sicknesses, and lusts, is the cause of our groaning. While we are groaning, “we eagerly await a Savior, the Lord Jesus Christ, who will transfigure the body of our humiliation to be conformed to the body of His glory” (Phil. 3:20-21). All believers in Jesus Christ have been born of God and have the sonship. Throughout our Christian life we cooperate to let this sonship grow in us. Growth unto maturity, while awaiting our Lord’s appearing, is our path to New Jerusalem. The Lord will shine with great glory from His return to eternity in New Jerusalem. Today we are “the light of the world” (Matt. 5) and “shine as luminaries, holding forth the word of life” (Phil. 2). Romans 8:16-17 say, “The Spirit Himself witnesses with our spirit that we are children of God. And if children, heirs also; on the one hand, heirs of God; on the other, joint heirs with Christ, if indeed we suffer with Him that we may also be glorified with Him.” Here are several facts: we are children of God, we are heirs of God and joint heirs with Christ, and we will suffer with Him to be glorified with Him. 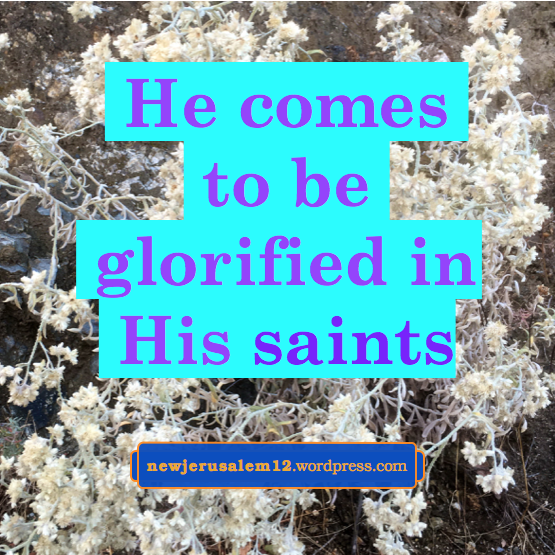 To be glorified with Him is preparation for the city of glory, New Jerusalem. We are told that our path to glory involves suffering. All humans have troubles in areas such as family, health, work, and housing. In our suffering we should be “with Him” always turning our heart to the Lord. God’s kingdom and glory are linked; for example, “God, who calls you into His own kingdom and glory” (1 Thes. 2:12). Eternally, in New Jerusalem there will be no more suffering but we will participate in the fullness of God’s kingdom and His glory. In His return, in the manifestation of the kingdom, and in New Jerusalem Jesus Christ will be shining brightly with the glory of God. We too will be shining because He is in us and will shine through us. Romans 8:29-30 speaks of God’s foreknowledge and predestination, which were in eternity. Then His calling and justifying, which have been accomplished. These verses also speak of our being conformed to the image of God’s Son and being glorified. This conformation and glorification are the result of His work within us. The steps from foreknowledge to justification are preparation. Conformation and glorification are a process which changes us* from people of the fallen old creation to people of the glorious new creation to be part of New Jerusalem. 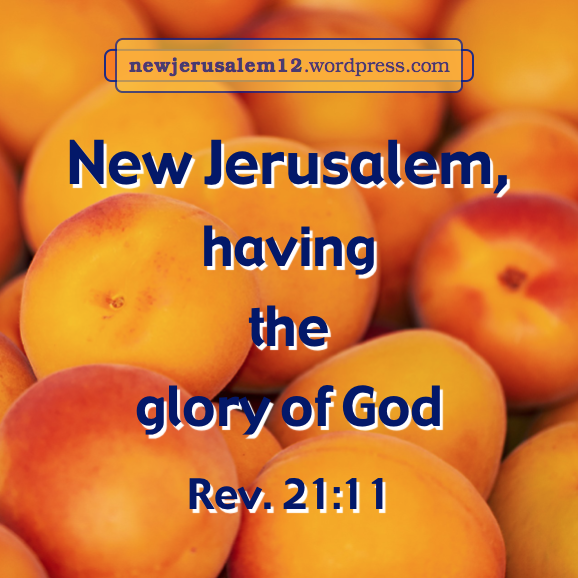 We will be glorified to match New Jerusalem as the city of glory. * Romans 8:29-30 are past tense because in God’s view everything has been done. In our view conformation and glorification are in process and will become visible at the Lord’s return. On the mountain the Lord Jesus shone like the sun (Matt. 17). He will come again with great glory. After His coming, when judging the nations, He will sit on the throne of His glory (Matt 25:31). We expect Him to be with great glory on the throne of New Jerusalem. The Lord Jesus will shine very brightly in His return and afterwards. What about us? Today we “are the light of the world” and should “let your light shine before men” (Matt. 5:14-16). We also should “shine as luminaries in the world” “in the midst of a crooked and perverted generation” (Phil. 2:15). 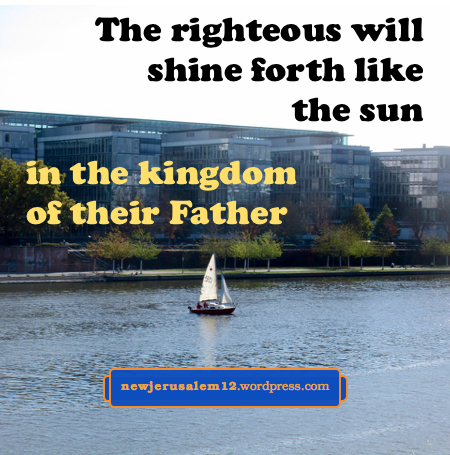 As the outcome of these stages of shining, we should expect to shine in New Jerusalem. However, this shining is not from our natural being nor based on our natural capabilities nor attainments. The shining now and in New Jerusalem is our transparency to allow Christ to shine through us. One day the Lord Jesus said, “Truly I say to you, There are some of those standing here who shall by no means taste death until they see the Son of Man coming in His kingdom” (Matt. 16:28). How is this related to New Jerusalem? Simple; New Jerusalem is the ultimate manifestation of God’s kingdom, with the throne of God and the Lamb at its center. The Lord’s transfiguration was the release of glory from within Him. This was also His coming in His kingdom. This transfiguration was temporary. When they went down the mountain the glory was again concealed within Him. The glory will again be manifested when the Lord Jesus returns visibly. 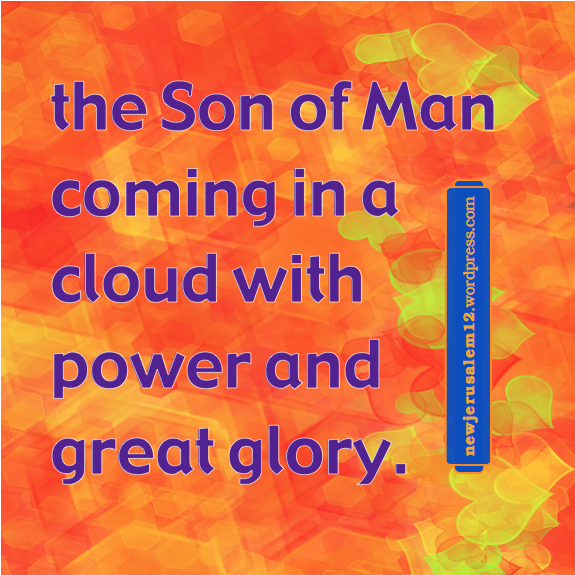 In Luke 21:27 He says that men shaken by the tribulation “will see the Son of Man coming in a cloud with power and great glory.” And, “when the Son of Man comes in His glory…He will sit on the throne of His glory” (Matt 25:31). 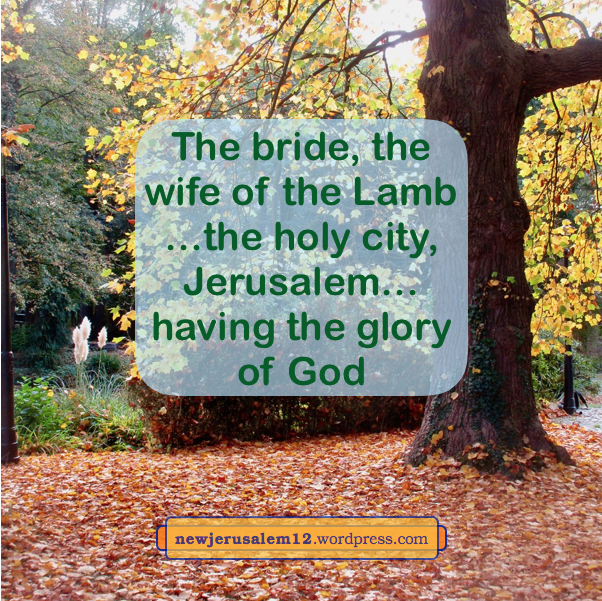 Based on these verses, we should expect that God and the Lamb on the throne in New Jerusalem (Rev. 22:1, 3) will radiating great glory. New Jerusalem is not a physical city. It is a corporate person composed of all the children of God to be “the bride, the wife of the Lamb” Jesus Christ (Rev. 21:2, 9-11). Regular posts on this blog will resume Wednesday, January 2, 2019.